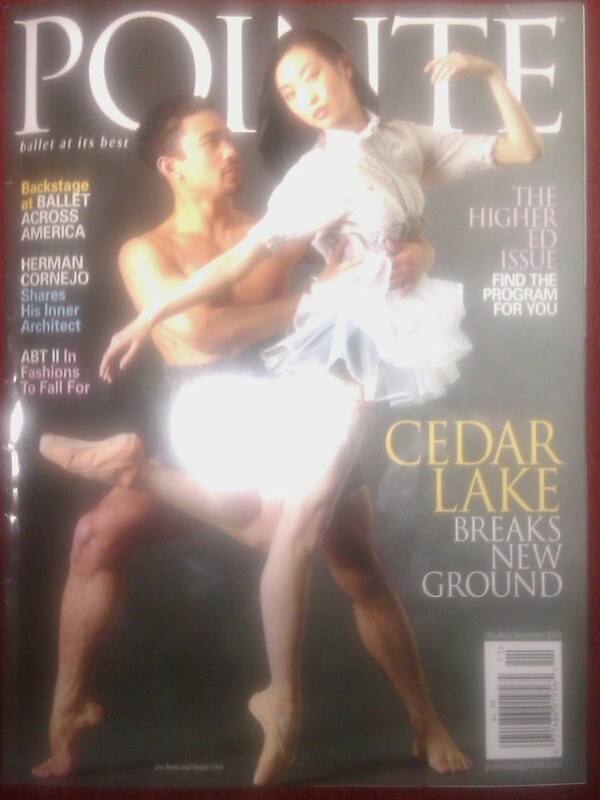 Nothing like coming home to two dance magazines in my mailbox! And, fun for me, I had an article in each. One on Lesley Rausch and one on Laura Gilbreath. Both magazines have excellent editors, so it’s not too scary to see what happened to your article after you sent it off. I tucked into my first article, one on Lesley Rausch learning Coppélia. And then I saw the kind of oops that writers freak out about. (I did freak out. Ask my husband.) The kind where editing changes the meaning or attribution of a quote. Eek! For those of you who read Pointe (and if you’re a ballet dancer in training, you should: there are loads of good health tips and technique tips in it…plus neat pix and interesting profiles), please note that Lesley Rausch did not call herself spunky, intelligent, and energetic. Those were my words and my opinions, based on her spunky, intelligent comments in interviews and her dancing onstage and off. How do these changes happen? You wouldn’t guess it from my chatty writing on SeattleDances, but I’m an editor in my other life; I can tell you how errors creep in. You want to fix the copy, to make it fit your audience or your house style. Or, you need to cut words. Or, something doesn’t read clearly and you do your best to make it work. Maybe (probably!) you’re in a hurry, because so many of us editors are. Likely, several people are asking for changes and you have to keep them all straight. And even if all your edits are amazing, it still only takes something as simple as sending the designer draft #3 by accident instead of draft #4. These slip-ups happen, well, everywhere, I imagine. None of us has to look too far back into the past to find a personal example. I apologize for the embarrassment this slip-up could cause Rausch. Pointe has also apologized. Hopefully most folks won’t even notice it… My husband, marvelous man, didn’t think she had said it. Maybe other readers won’t either. But for those who do: She didn’t; I did. And yes, that last line especially needs an editor! Don’t forget about the arms as you’re bravely hopping across the stage. Rausch has made a conscious effort for several years to soften her arms and upper body and to use her breath to lighten the overall effect. Her effort has paid off: her expressive arms seemed to caress the air. The coda’s attitude pirouette en dedans, relevé fouettée into arabesque looks natural on Rausch, not swoopy but flowing. The pirouettes, right and left, from a real, closed fifth position call for concentration.